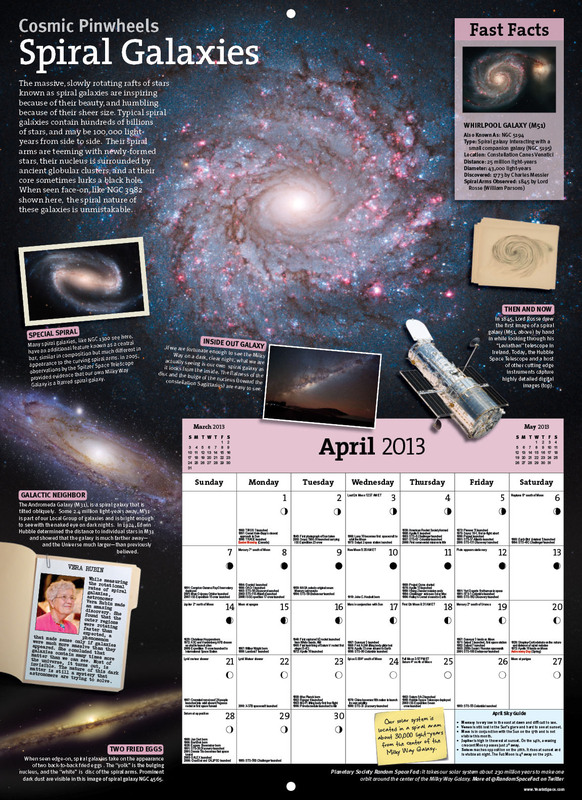 The 2013 Year in Space wall calendar is chock-full of astro awesome. Do you need a new calendar? Of course you do, the year’s almost over. (And if you’d forgotten, well.. you’re welcome.) Of course if you’re reading this post you’re most likely a fan of space exploration, and so you’ll need a calendar that’s going to entertain your fascination about space for a whole year. And with that statement The Planetary Society CEO and self-proclaimed “Science Guy” Bill Nye introduces you to the 2013 Year in Space wall calendar, a large-format 16″ x 22″ (40.5 x 56 cm) glossy showcase of space-themed photography assembled by Steve Cariddi that contains enough information to keep any space fan entertained well into 2014. It’s a great gift for the space fan(s) in your life — just don’t forget one for yourself too. I had the privilege to review one of these in person and I must say I’m very impressed. I’m a graphic designer and I can say that the layouts are very well done, the images have never looked better and the sheer wealth of information included was staggering. These are definitely not your typical mall-kiosk calendars! Right now, the Year in Space 2013 calendars are available for order online here for the crazy low price of $12.95 each or $11.95 for 2 or more (with additional discounts at higher quantities) as well as free shipping throughout the U.S… and you’ll also get 50% off a new membership to The Planetary Society if you order online. And if you’re feeling particularly lucky there’s a contest going on over at Universe Today, they’re giving away YIS 2013 calendars to 5 participants who enter before Friday, November 30th. You can’t win if you don’t play, so put your name in here. And this – beautiful !! – calendar don’t exist in… French language ?? Sorry Jeff, I don’t think it’s been printed in French.